The Spirit of Speyside Whisky Festival has become something of an annual pilgrimage for whisky enthusiasts, but it’s not just the exclusive bottlings and behind-the-scenes tours that keep visitors coming back for more, as Becky Paskin reports. ‘What’s this?’ a voice cries in the dark, as a bottle of Talisker 18-year-old is dug out of the sand in a not-quite-believable act of fortuitous discovery. The news lights up the faces crowded onto Craigellachie Beach in the reflective glow of the roaring riverside campfire. Talisker-infused marshmallows are passed around and toasted over the hot flames – at arms’ length – as generous drams are poured and glasses are clinked in appreciation of the shared moment. It’s a perfect evening, even if the promised starry sky stayed shyly hidden behind the clouds. Whisky Under the Stars was one of the new events introduced to Spirit of Speyside Whisky Festival this year (3-7 May), designed, according to #LoveScotch ambassador Ervin Trykowski, to ‘show serious malt drinkers they can enjoy Scotch in so many different ways’. Just moments earlier a tin jug attached to a piece of rope was flung over the side of Telford Bridge to fetch fresh water from the Spey to add to our glasses of Cardhu Distillery Reserve. ‘Oh no,’ said one fella from the Netherlands, ‘we don’t add water to our whisky’. Moments later he and his purist friends were drinking Singleton of Dufftown 12-year-old with Lilt, from aluminium bottles that had been submerged in the Spey to chill. ‘We like to talk about the fun side of Scotch whisky,’ Trykowski says with a chuckle. 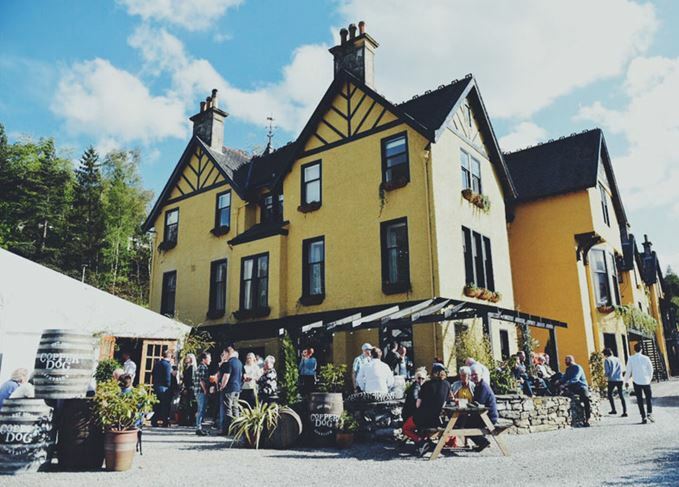 The festival itself is a ‘dram-packed’ five days of whisky tours, tastings, entertainment, walks and talks designed to appeal to both newcomers and serious enthusiasts alike. Nature lovers will have enjoyed the botanical and wildlife-themed ambles through daffodil-strewn landscapes, while the more adventurous could get their fix with an energetic canoe trip down the Spey (followed by a wee nip at the end of course). There was plenty to keep visitors occupied well into the evenings too, with ceilidhs, live music from Scottish bands (including Barley, Stills, Mash & Tun (aka #TheWhiskyBand) and BBC Introducing act Be Charlotte), extravagant whisky-themed dinners and even a raucous film-themed pub quiz. While #LoveScotch and whisky writer Blair Bowman’s Whisky Under the Stars jaunt was one of the more quirky events on offer, the official award for Best New Event went to Chivas Brothers’ Off the Beaten Track tour of four distilleries that are usually closed to the public – Allt-A-Bhainne, Braevel, Dalmunach and Tormore. Perfect for those eager to check a few more distilleries off their bucket list, behind-the-scenes tours like this – which are among the first events to sell out – are one of the reasons why Spirit of Speyside has become an unmissable pilgrimage for whisky enthusiasts from all over the world. The growing number of exclusive festival bottlings from distilleries and independent bottlers is another, although overnight queues that can be witnessed during Islay’s Fèis Ìle later on in the month have yet to arrive in Speyside. The annual increase in visitors descending on Speyside over the weekend has in turn led to more events than ever competing against one another for ticket sales. More than 10 are held at any one time, making it impossible to see and do everything. A planned itinerary is vital, but even so the vastness of the region makes it difficult to fit in more than a handful of events each day, and that’s if you have your own transport. I’d been wondering how non-drivers manage – one group I met had hired a chauffeur for the duration; cheaper and more reliable than taxis, they’d said – when I discovered there is an official Spirit of Speyside Facebook group dedicated to offering and requesting lift shares. A brilliant idea, if only more people knew it existed (at last count it had only 150 members). As the festival grows in size (next year’s takes place on 2-6 May 2019), a dedicated mobile app would be useful to manage itineraries, recieve live updates and share messages among the festival community about lift shares. That’s what the festival is about after all. Aside from the whisky, the postcard-worthy scenery, the world-class live music and exclusive tours, what makes the weekend so special is the sense of community that bowls you over the second you arrive. The warm hospitality and welcoming smiles, the meaningful embraces as long-distance friends meet again, the shared enthusiasm for whisky from residents and visitors alike. That’s the real spirit of Speyside, and it’s something the festival captures so elegantly.